The dSS22 is used in MFHs that have a separate building network. 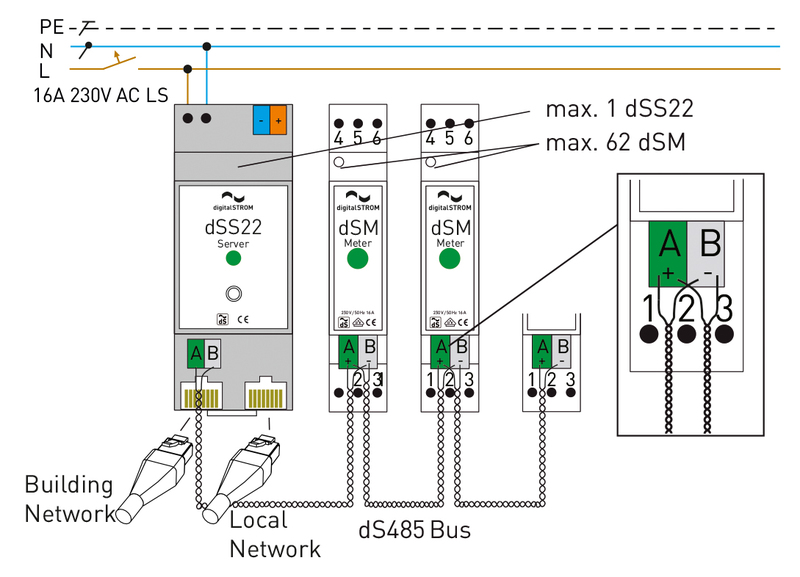 The dSS22 has two network interfaces ETH1 for the private network ETH 2 for the building network. The server is installed in your fuse box. Thanks to its powerful software, you can easily configure your digitalSTROM applications via computer and web browser. In addition, the dSS22 allows you remote access via computer or smartphone - and as a platform for the unique digitalSTROM apps, it opens up a whole world of innovative applications for all areas of digitalSTROM use. The digitalSTROM server "dSS22" recognizes all digitalSTROM devices installed in your electrical installation and also IP devices that are integrated into a completely new world of intelligent home control. Devices are connected to each other in the simplest way and can be conveniently operated via smartphone apps or voice. Intelligent services are constantly learning new things and take you into a new dimension of user experience. The digitalSTROM orchestration enables the devices to interact easily and informs you e.g. by means of flashing lights, voice output or a push notification when another device has completed its task or another event has been triggered in the house. How, for example, the motion detectors for the lighting can be used as alarm detectors during your absence. The IP devices connected in the network are detected by the dSS22 using a technology specially developed for this purpose and integrated as a digitalSTROM device. This gives it the typical characteristics of a digitalSTROM device and it switches off automatically when you leave the house, for example. This standard behaviour and much more can be easily set via a web interface. The digitalSTROM server not only provides a convenient website for monitoring and setting up all building-wide digitalSTROM components, but is also a platform for a variety of innovative applications relating to the control of a house. Further information and safety instructions can be found on the Produktseite.